The rolling atrocity that is the Donald Trump White House has proved as dangerous, chilling, indecent, and nationally embarrassing as promised. Most of the public and vocal opposition to Trump’s highly unpopular presidency has been voiced from his left. But not all of Trump’s critics reside on the portside. Consider the case of Republican U.S. Senator Jeff Flake (R-AZ), who wants to unseat Trump in the name of the “free market” and “small-government.” Released to great fanfare, United States Senator Jeff Flake (R-AZ)’s slim and elegantly written book Conscience of a Conservative (the title is deliberately taken from the famous 1964 manifesto by Flake’s Republican and Arizona predecessor Barry Goldwater) is a stealthy assault on the sitting President of the United States. Flake accuses Trump of “erratic behavior, unmoored from principle.” He identifies Trump with the “cult of personality” and the narcissistic culture of “celebrity.” He chastises Trump for advancing “raw exercise of power” over “the art of persuasion and the battle of ideas.” He rips Trump for purveying false narratives like the absurd charge that Barack Obama wasn’t born in the U.S and the ridiculous claim that Trump was denied a popular vote victory over Hillary Clinton by illegal immigrant votes. Most politically engaged U.S. citizens would likely agree with Flake’s assessment of Trump, with good reason. But Flake is wrong to portray Trump as a “populist” enemy of global capitalism—a charge that recurs through Conscience of a Conservative. Populism properly understood is about popular and democratic opposition to the rule of the money power—the reign of concentrated wealth. It emerged from radical farmers’ fight for social and economic justice and democracy against the plutocracy of the nation’s Robber Baron capitalists during the late 19th century. Contemporary populists worthy of the label are social democrats like Bernie Sanders or Robert Reich and leftists like Noam Chomsky or Jeremy Corbin. They back human rights, social justice, popular democracy, peace, and ecological sanity. They support racial and ethnic equality and unity in the interest of popular and working-class solidarity and struggle from the bottom up. They want government to serve the broad majority not the wealthy corporate and financial few. The quasi-fascistic real estate baron and media personality-turned president Donald Trump is no populist. His tax plan—crafted by Goldman Sachs veterans and top White House officials Gary Cohn (Trump’s economic adviser) and Steven Mnuchin (Treasury Secretary)—is transparently designed to benefit big corporations, private equity managers, and other super people like President Trump. His efforts to deregulate finance and energy and privatize public resources are transparent gifts to the global rich and powerful. So is his remaking of the federal judiciary in the image of the right-wing Federalist Society. Conscience of a Conservative is dedicated to one of the great false dichotomies of our neoliberal time: the enduring alleged conflict and contradiction between marketplace (really corporate) capitalism (the so-called “free market”) on one hand and “big government” (allegedly socialist and/or fascist) on the other hand. The great economic historian Karl Polyani got it right when he noted that 19th century “free market” advocates who pushed for “less government” were really fighting for a different kind of government—one that favored them and their wealthy business patrons. The same point holds for Flake, who identifies as an acolyte of the leading neoliberal “free market” economists Milton Friedman and Friedrich Hayek. Beneath their standard, quasi-libertarian discourse about the epic conflict between “stultifying government bureaucracy” (bad) and “free market” capitalism (good), “free trade” champions like Flake and House Speaker Paul Ryan (R-WI) are really advocating not laissez-faire (less or no government) but rather regressive, pro-corporate government policy. Their “anti-government” rhetoric cloaks the actual and core policy question. The real issue is not whether government can or should “work.” It’s who government should work for: the public and the common good or concentrated wealth and power? Flake, Ryan, and Charles Koch may proclaim a desire to “starve the [government] beast” and “cut government down to the size where we can drown it in the bathtub” (leading Republican anti-tax guru Grover Norquist). They really want to shrink what the late French sociologist Pierre Bourdieu called “the left hand of the state”: programs and services won by past popular struggles and social movements for social justice, equality, and inclusion. They do not wish to take the budgetary or policy axe to the “right hand of the state”: the parts that provide service and subsidy to concentrated wealth and dole out punishment for the poor. Flake thinks we need less government. More Americans (this reviewer included) think we need different and social-democratic, left-handed government for the Many, not the wealthy few—something more like what is proposed by Vermont Senator Bernie Sanders, the most popular politician in the U.S. today. These criticisms aside, Flake is to be applauded for courageously calling out Trump and his many enablers in the Republican Party for their dangerous dance with authoritarian and bigoted white nationalism. As Flake admirably insists, matters of national policy need to be determined through open, respectful, honest, multi-partisan, and civilized debate, not through bullying, coercion, and partisan warfare. 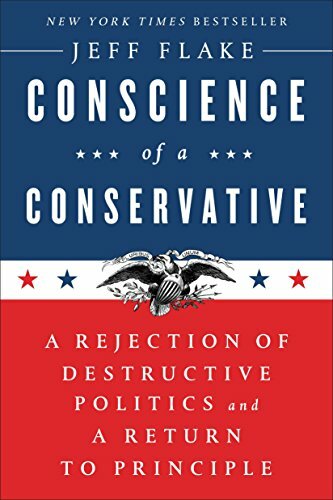 In that sense, Conscience of a Conservative lives up to its advertising as “a beacon not only to conservatives but to concerned Americans and people of good faith of all political persuasions.” One need not share Flake’s faith in marketplace (really corporate-state) capitalism to respect his call for a new and open policy debate in a post-Trumpian America.